Bishop Thomas L. Dupre, the leader of the Roman Catholic Diocese of Springfield who has been under fire for his handling of sexual abuse cases involving priests, resigned yesterday, a day after he was confronted with allegations that he had sexually abused two boys more than two decades ago. "After I conveyed [the allegations], I never heard back," Dupont said. Diocesan officials said Dupre checked into a medical facility Tuesday, but refused to identify the facility or to say what condition Dupre was being treated for, citing privacy concerns. Sniezyk said that the mother of one of the alleged victims had met with the Rev. James J. Scahill, a priest in East Longmeadow who has accused Dupre of protecting abusive priests, and that Scahill advised her to speak to the diocese's misconduct review board. Sniezyk said that the mother has not appeared before the board and that the diocese had no formal complaint upon which to act. "The board could not act unless and until it heard from the victims themselves," Sniezyk said. "We're encouraging them to come forward." According to three individuals who were told about the allegations, Dupre is alleged to have sexually abused the two boys after becoming close to the family of one boy, whose father had died. Roderick MacLeish Jr., a Boston lawyer who represents the family friend, pleaded for reporters not to identify his client or the other alleged vctim. The Republican newspaper reported that it had spent months trying to corroborate the allegations before confronting Dupre. The article said the newspaper was withholding the identity of the woman who made the allegations because her son does not want to press charges. 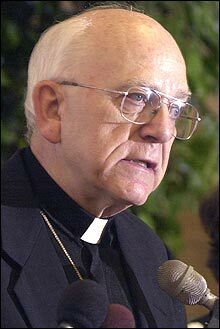 Dupre, who had been bishop of the diocese of 260,000 Catholics in Western Massachusetts since 1995, had been under fire in recent years by victims who claimed he had coddled abusive priests and dragged his feet on settling several dozen pending lawsuits against the diocese by those who said they were abused by priests. In particular, Dupre had drawn fire for his handling of the Rev. Richard L. Lavigne, who had been convicted of abusing boys in 1992 and is a suspect in the 1972 murder of Springfield altar boy Daniel Croteau. Under pressure, Dupre last year sought to defrock Lavigne, and informed Lavigne of his laicization just last month. Victims and their lawyers pointed yesterday to the allegations against Dupre as evidence of why Dupre dragged his feet on defrocking Lavigne and in settling pending lawsuits. "This explains why they have litigated it this way, dragging the victims along for so long," said John J. Stobierski, a Greenfield lawyer who represents 40 people in 21 cases against the diocese. "If the apple was rotten at the top, who knows what's beneath it? Who knows how deep this is?" Steve Block, a Springfield man who says Lavigne began abusing him in 1972, just months after Lavigne became a suspect in the murder of the altar boy, was furious when he learned of the allegations against Dupre. "What really makes me sick is he went off and hid in a hospital," Block said. "No wonder he protected all these other priests, including Lavigne. What a coward." Thomas Martin, a neighbor of Block's who also says he was abused by Lavigne, said he nearly "fell off my chair" when he learned of the allegations against Dupre. He praised Scahill, who has become a confidant of some of the alleged victims, for helping to expose the allegations. "The pope should make Father Scahill the new bishop," Martin said. Lawyers and alleged victims, who have accused Dupre of footdragging in settling about 40 pending cases of abuse by priests, said they hoped Dupre's successor would be more open to resolving the outstanding cases. Some said they hoped that Archbishop Sean P. O'Malley, who made the settling of more than 500 cases of sexual abuse his first priority when he was installed as archbishop of Boston last July, will use his influence in the appointment of a new Springfield bishop who shares his views on the matter. As metropolitan, or senior prelate, of the Catholic province of New England, O'Malley would normally be consulted by Vatican officials before a new bishop is chosen by the pope.